Eaves do very important work. From a practical perspective, they help to keep the rain water that drips off of a building's roof away from its walls. Water on the walls will become trapped water inside the walls, which quickly leads to mildew, mold, and rot. Similarly, eaves keep icicles from forming directly on a building's outer walls (an icicle on the wall can become an icicle dripping down the wall, leading again to water inside the wall). Eaves that stick out 6" are just barely deep enough to keep rain off; a 9"-12" overhang is better. 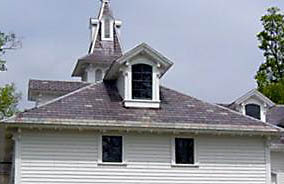 The Carriage House eaves shown here are 18" deep. Copper gutters - now worn out and removed - originally sat in the curved brackets running along the edge, adding 4" more depth as well as redirecting the water. Eaves are also for play, of course - they make the carriage house fun to look at. And without eaves, this building would just be an awkward box with bumps. The length of the eaves, their edge moldings, and the rows of brackets underneath all come together to create a roof that visually shelters what's inside and delights the eye. 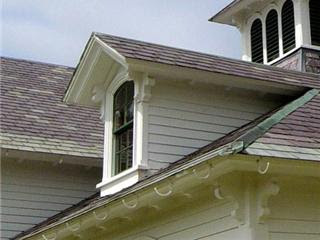 The corbels facing both ways at the ends of the dormer windows and the at the barn's cornerssee the first photo) are just frosting on the cake. The eaves here have another job - quite visible in the second picture. This is the south view of the western end of the barn - the eaves keep the summer sun from shining in the windows. This photograph was taken in early May, when the shadow line of the eaves is below the small windows in the stable - the sun will not shine in these windows again until late August. With the extra 4"of gutter, the windows would be shaded earlier and later in the year. Because the sun's path across the sky changes with the seasons (due to the Earth's tilt and rotation around the sun), in winter the sun will be low enough in the sky to shine below the eaves, and into those windows, bringing light and heat to the space inside. That's a lot of creative 'green' stuff for an ordinary building detail to do. Read Building to the Weather - Part 3.